n RT NomyPti: Waisay Lahore Qalander done Blunder.....! @KarachiKingsARY get their first free-hit... and @54simmo 's smacks it OUT OF THE GOUND! Karachi Dama Dum Mast ???? Pakistan first RT NomyPti: Waisay Lahore Qalander done Blunder.....!
. 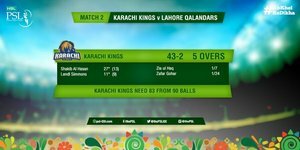 @KarachiKingsARY were tottering at 5/2 when @Newbigdog dropped @Sah75official . They've zoomed to 57/2 off the power play since then. #HBLPSL ke 2nd Match mein #Lahore Qalandars ka #Karachi Kings ko Jeet ke liye 126 Runs ka Target, Muhammad Aamir ki Hat-Trick.